It’s great playing the blues but usually that requires either playing open first position chords which don’t sound very bluesy, or having to play more difficult chords up the neck a bit. Fear not! I’ve got the perfect solution for you. You can play just one chord shape for the whole of the 12 bar blues. And it only uses 2 fingers. Well, ok, there’s a tiny bit more to it than that. We’ll need to move this shape a little bit to deal with the changing harmony of the 12 bar blues. So here’s how to use this one shape to play a blues in A. So all you have to do here is move the chord shape down a fret to get the IV chord and then up one fret to get the V chord. All you have to do is move the chord shapes up or down the neck to play in different keys. 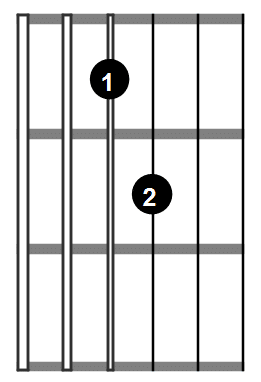 So move it down 2 frets to the 3rd fret and you’ll be playing a blues in G. Move it all up 2 frets and you’ll be in B etc. OK, it’s easy to play but not so easy to work out what’s happening. How can that be an A7 chord? Well, what’s happening here is that we’re not playing the roots of the chords, we’re just playing the 3rd and b7 of each chord and leaving out the root note. For more into about chord construction try this page. Leave a comment below and then try out on of these other pages. Learn some great jazz chord shapes to add a sophisticated sound to your blues playing. Great for simple comping and comp and fill. A great blues song by Robert Cray. See a great example of how to vary the normal structure of the blues.